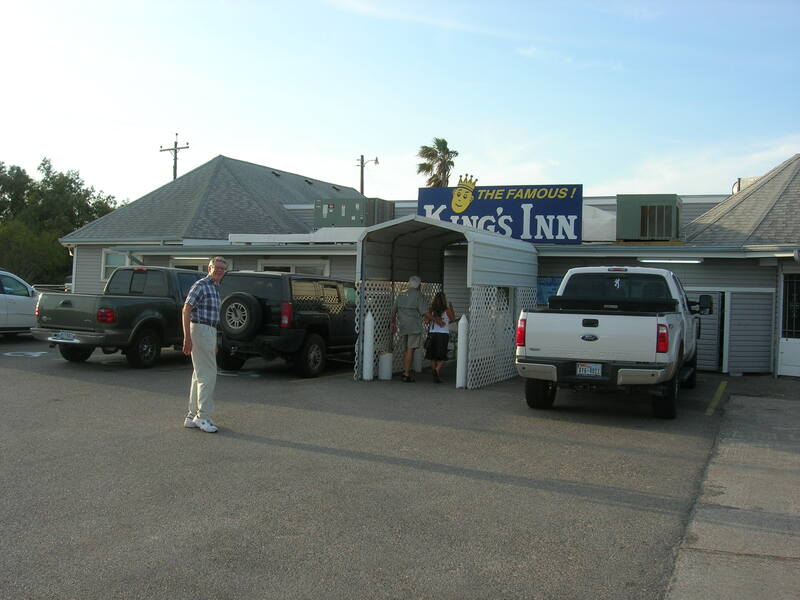 Lots of people know about the King’s Inn, the iconic seafood restaurant on Baffin Bay south of Corpus Christi and–keep driving!–south of my home town Kingsville too. 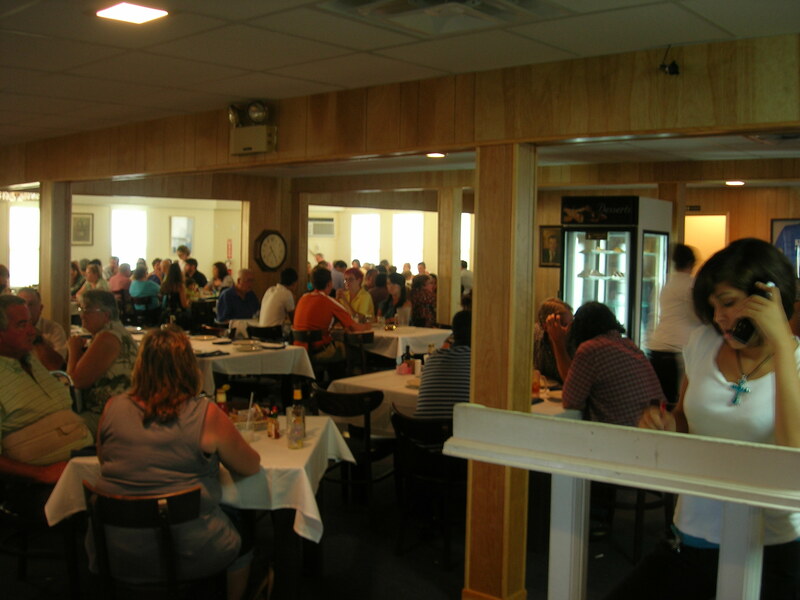 Every graduation, every anniversary, every reunion is marked by a trip to King’s Inn, and most first dates, family visits, kid’s birthdays, and fishing trips as well. I remember reaching up to hold my daddy’s hand as we walked into King’s Inn! So I was really looking forward to ending my visit to Texas with our traditional King’s Inn dinner. What happened? We got there just on time at around 7:30. 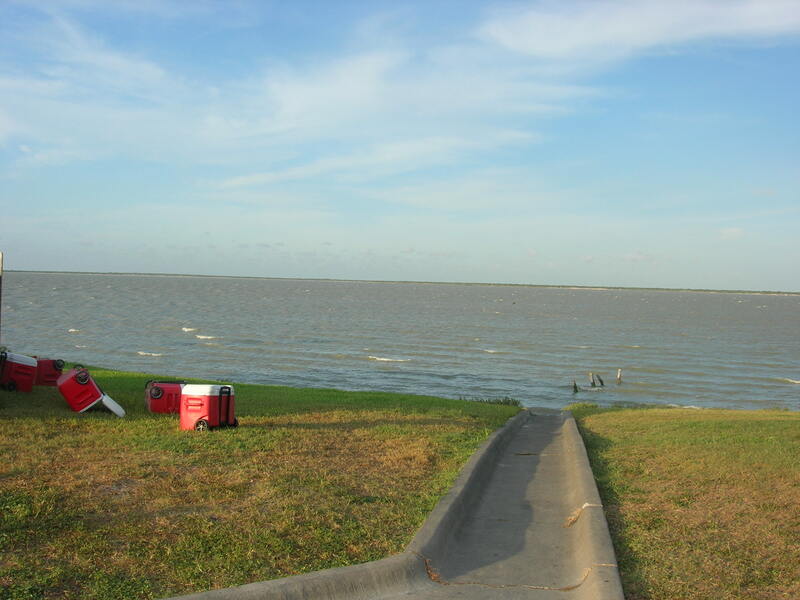 (After what has now beco me the inevitable drive through the near-by RV park. It’s nice. They maintain it well. Can we go get our fish now?) Here’s my brother Robert heading in the door, and here he is with my sister-in-law Marilyn and my other brother Ron with his friend Silvia. King’s Inn is a big sprawling informal place right on the bay, always packed on Saturday night. We always order exactly the same thing. 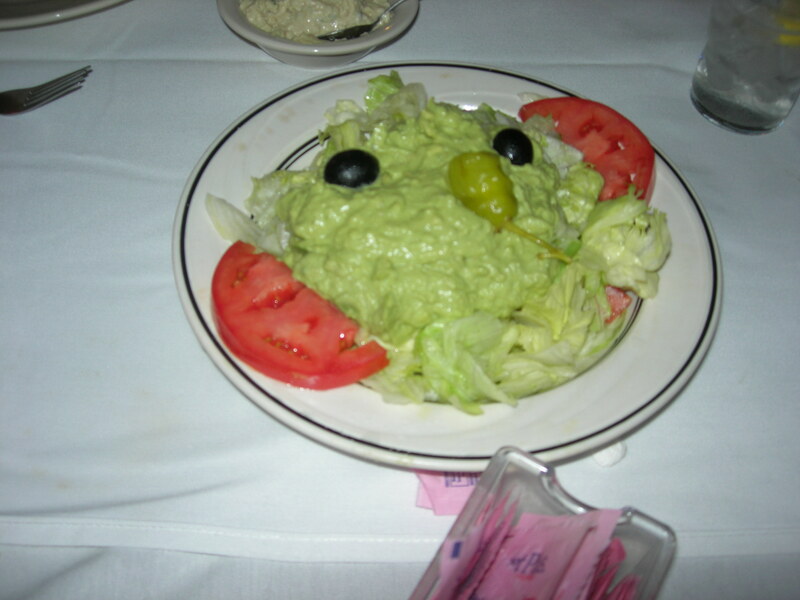 We start with a Bombay salad (a fantastic avocado puree livened up with a lot of garlic and a little bit of curry), with a big side of sliced tomatoes ripened to juicy succulence by the South Texas sun. 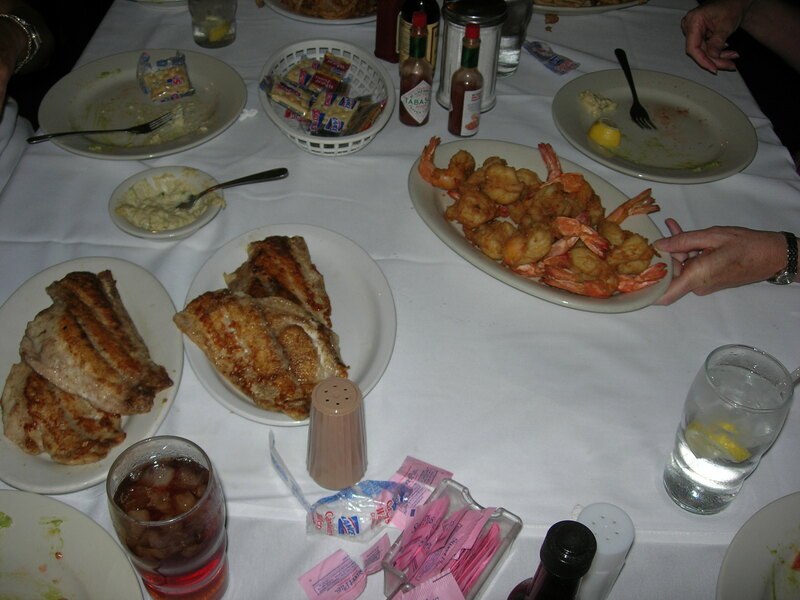 Then we have fried Gulf shrimp, grilled fish, french fries, and breaded onion rings. The salad came pretty quickly, and we polished it off just as quickly. Then–? Nothing. Our server filled us up with tea, brought more crackers, and apologized more than once. What was the deal? Well, they had gotten backed up in the kitchen. Surprised by a bigger crowd than they expected. I’m sorry, I just don’t buy it–they’ve been feeding huge Saturday night crowds for over six decades. Finally, around 9:00, we spotted trays of shrimp beginning to sweep across the room toward the more haggard and slumped occupants of the corner tables. And then, way over by the kitchen door, our server appeared with a big grin and thumbs-up, tray laden with our whole order! I hardly paused to take a picture of the plump shrimp and beautifully grilled fish (it was drum, similar to redfish), served family style as always. Given our state, I had to focus on getting my share! But the fish was great as always, made with maybe only a very thin egg wash (if that) and dredging in scant seasoned flour. The fried shrimp (the three that I could wrestle away from my brothers!) were firm, briny, and wonderful. Sweet breaded fried onion rings, thin light french fries. Great food! We asked a couple of times but couldn’t get further enlightened about what went wrong. My sister-in-law mentioned the sprawl of coolers out on the bay side of the restaurant; maybe evidence of some kind of last-ditch damage-control action? I don’t know. But I’ll go back next year and update you on how it goes. Everybody gets a second chance, right? 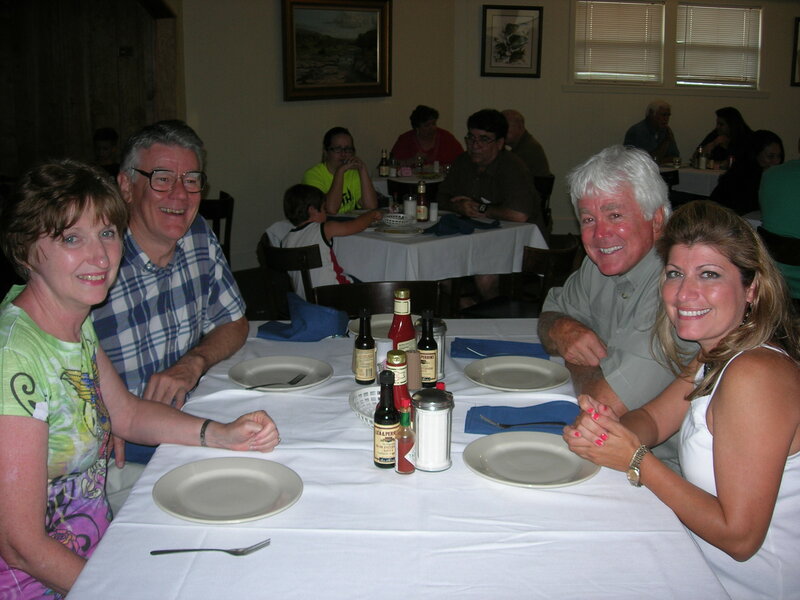 And after all, once it arrived, the food was good as ever!